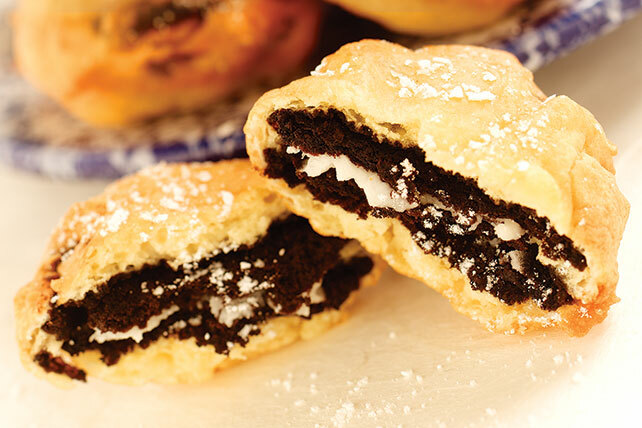 Chocolate sandwich cookies are dipped in doughnut batter and deep-fried until crisp and golden brown. Serve warm with powdered sugar. Mix flour, granulated sugar, baking powder and salt in medium bowl; set aside. Beat eggs and milk with wire whisk until well blended. Add to flour mixture; mix well. Let stand 10 min. Meanwhile, pour oil into deep fryer or large deep saucepan to 3-inch depth; heat to 375°F. Dip cookies, 1 at a time, into batter, allowing excess to drip back into bowl. Gently add cookies to hot oil. Fry, 3 to 4 at a time, until golden brown on both sides, turning over halfway through the cooking time. Drain on paper towels; sprinkle with powdered sugar. Serve warm. Sprinkle sugar over doughnuts by placing sugar in mesh strainer and shaking over doughnuts.